MAKE SHIFT is the first solo exhibition by Liverpool-based artist Emily Speed, featuring sculpture, installation, drawing and photography. Emily's work explores the temporary and the transient through reference to architecture and the body. She examines buildings, both literally and metaphorically, as physical shelters and as containers for memory, bound with the history of their occupiers. The now empty student accommodation buildings and the lake are both sites in the Park that have inspired new works. Using abandoned furniture that was a temporary part of the lives of generations of students, Emily built new hiding spaces, giving a fleeting new existence to vacated spaces. 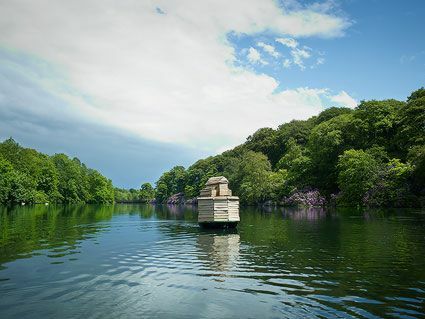 She also made a coracle and added an architectural structure to create a floating shelter inside which she sailed on the lake at YSP in a documented performance.